This stunning cookbook combines beautiful photography and creative styling and design with excellent recipes that have been designed to make Japanese cooking accessible. 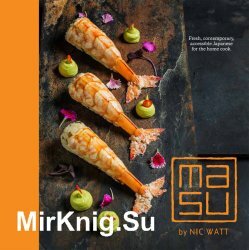 It's also the story of Masu a Japanese restaurant in Auckland winning awards, including Metro Restaurant of the Year 2014, and much acclaim from diners. Every cook needs this book in their kitchen so they can make beautiful Japanese inspired food. Nic Watt gives you lists of the items you need for a Japanese pantry, the tools to make great Japanese food and the philosophy behind it. You'll learn how to make sashimi the right way, how to make sushi simply, how to make great salads and soups and how to wow your family and friends with menus that look and taste sensational but are actually really easy to make.The book includes a number of delicious desserts and cocktails; try the scrumptious white miso pavlova and you'll be in heaven. This is clever Japanese inspired cooking for everyone.